When you purchase any iTandCoffee guide from the iTandCoffee store, you will be taken to a confirmation web page and receive a confirmation email that contains a link to the document that you purchased (or multiple links if you purchased multiple documents). By clicking or touching on any of these links (ie the text underlined in blue), you can download the applicable PDF guide to your computer or iPad. In particular, when you download the guide to your iPad, you can save it away to the iBooks app so that you can easily access it later. 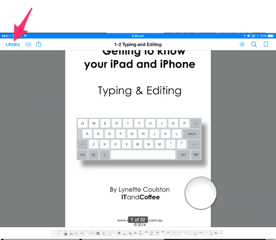 To be able to download the iTandCoffee guides to iBooks, you must first (of course) install the iBooks app on your iPad. If you prefer to use the Kindle app for reading, the iTandCoffee Guides can be saved to that app instead. 1. On your iPad, touch on a document link on the web page or in the email that you received. 2. The document will open in Safari. Be patient - it will take a little while for it to download and appear. 3. When the download is finished the title page for the document will appear on the screen. 4. 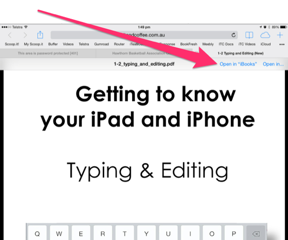 When you see the document appear on your screen, touch on Open in 'iBooks' at the top right of the page. If you don't see this option, just touch on the screen to make it appear. 5. iBooks will open, showing the book that you have just downloaded. 6. Swipe left and right to move through the pages of the book. 7. Touch on Library at top left to view all the PDFs that you have downloaded. If you don't see the Library option, touch the screen to make it appear. 8. All PDFs that you download will go into the PDF collection - you can then move them to a new collection if you desire.